Our work is not to figure out the problem solving around outreach but rather to reach out and then find the problems we need to address. When Karen Hagen arrived to pastor Tippecanoe Presbyterian in 1998, she found a remnant of 15 members who had stayed on after a church split. As Hagen and the congregation tried to figure out how to move forward, they realized their natural instinct to create peace in the storm was precisely how they could fill a need in their community. It was a big change for an urban Milwaukee church that had taken over a dance hall in 1917 and after years of a traditional worship model had suddenly found itself in disarray, causing the division. Remaining members adopted a more spiritual method, dabbling in multiple traditions rather than a typical corporate worship. At the same time, the church decided on a discernment-action strategy for outreach. “When you use the discernment-action model, you are discerning between two good things. Why not do the opposite—pick one, act on it and then ask what God is inviting us to become and do through it,” Hagen says. The church’s Living Waters Contemplative Life Center was the first outgrowth of that approach, offering spiritual formation through prayer circles, labyrinth walking and classes and retreats. Anyone is invited to participate regardless of affiliation or ability to pay. “We found that using the healing arts has a huge effect, so we brought in a number of spiritual healers to guide us. Hospitals have taken on the healing arts for profit, but we feel they should be back in the faith community where they belong,” Hagen says. The now 50-member church is perhaps best known for its Divine Intervention ministry, in its fourth year of providing care for up to 20 homeless adults each night at the church from Dec. 1 through March 31. Dinner and breakfast are provided, as well as a sleeping pad and take-away food for the day. “It takes 1,500 volunteer contacts to manage the program, and we must raise $45,000 above our church budget plus receive $10,000 in in-kind donations. But people are there for us because we are making a difference in Milwaukee, and they see that,” she says. 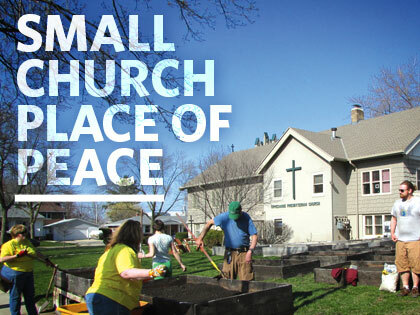 Although the church works with more than 35 faith organizations as well as local social services to operate the program, it is the church’s in-house mission. And it’s successful: Last year, 17 of the regular 20 guests at Divine Intervention got off the streets and into transitional housing. A former recipient of the Divine Intervention ministry is now helping others. After Larry emerged from homelessness, he joined the church and started his own ministry, “Larry Under the Bridge,” which distributes bagged dinners and basic supplies to homeless campsites. Larry’s desire to pay forward the compassion shown to him is integral to Tippecanoe’s outreach philosophy, Hagen says, and is exactly why the homeless guests are invited to participate in the church’s community garden.